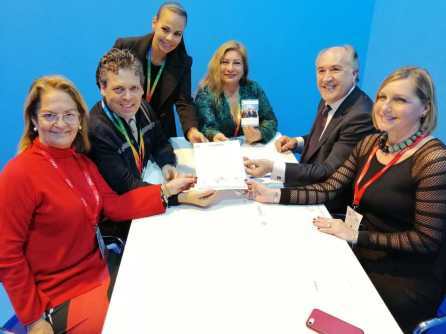 In the framework of the 39th edition of the International Tourism Fair, the government of Solidaridad handed over to José Ignacio Landaluce Calleja, mayor of Algeciras (Andalucia, Spain) the letter of intent for the twinning between that city and Playa del Carmen, in order to strengthen ties of friendship, cultural, gastronomic and tourist exchange between both cities that have in common the fact of having been the home of the famous flamenco musician, Paco de Lucía. Ernesto Bartolcucci Blanco, general director of Tourism, on behalf of the municipal president of Solidarity, Laura Beristain Navarrete, delivered the letter to the Spanish mayor in which the invitation to strengthen bilateral cooperation is extended. In the document Beristain Navarrete shows that the twinning is a great opportunity to strengthen ties of cooperation and agree an exchange program between the two cities, in principle to share the life and work of Paco de Lucía, native of Algeciras, who decided to settle down in Playa del Carmen, and whose work and legacy is valuable for all the people around the world. “I believe that the privilege of having shared a place in the heart of this great man, opens an opportunity for work and rapprochement between our communities and cultures, to honor his memory, and to open a vital space of rich exchange for our cities “Said the mayor. Through twinning, Algeciras seeks cultural, gastronomic and tourism promotion, together with support projects for the formation of groups of artists and cultural representatives that allow Spanish art, music and other experiences to be diffused worldwide.